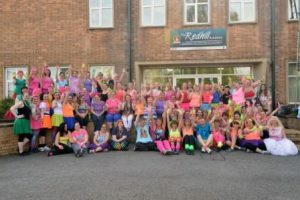 Zumba4fitness has held four Zumbathon fund raising events with up to 100 participants at each event dancing continuously for 90 minutes to raise much needed funds for charities. A total of £20,413 has been raised since 2012 for Clic Sargent, Help 4 Heroes, Cancer Research and Alzheimer’s Society. On Saturday 13th May 2017 Zumba4fitness hosted it’s fourth fund raising event for the Alzheimer’s Society. On Saturday 13th May 2017 Kris Fitness held its fourth fund raising Zumbathon event to raise much needed funds for registered charity Alzheimer’s Society, the UK’s leading dementia support and research charity providing support for anyone affected by any form of dementia in England, Wales and Northern Ireland. Participants danced continuously for one and half hours to raise money for Alzheimer’s Society. The total figure raised was £2,488.15 through ticket sales, donations, sponsorship payments and events held on the day including raffles, cake & gift sales and tombola. The Alzheimer’s Society carry’s out research, campaigns for the rights of everyone affected by dementia and offers information, advice and support for everyone affected by Dementia. They are the only UK charity investing in research into dementia care, cause, cure and prevention. They fight for the rights of everyone affected by dementia. Their campaigns keep dementia firmly at the top of the political agenda and they raise awareness, pushing for a more dementia-friendly society so people with the condition can live without fear and prejudice. Since February 2013, more than 1.7 million people have signed up to become Dementia Friends learning about the condition and the small things that people can do to support people with dementia in their communities. For further information or anyone wishing to make a donation please see the donation page. A huge thank you from Kris to everyone that participated and to all of the supporters that attended on the day and to the following individuals for their support, hard work and donations…Anne Greener, Elaine Chadbourne, Emma Picker, Jenna Bradshaw, Jenny Moran, Harriet Carnill, Laura Scott, Lauren Green, Nev Bradshaw, Paul Sharman, Paula Forrester, Sarah Quinn, Sue Button, Tammy Riley, Tracey Britton and Tracey Watson. On Saturday 26th April 2014 Zumba4Fitness held a fund raising Zumbathon event to raise money for registered charity Cancer Research UK. Over 90 participant danced continuously for one and half hours to raise money for Cancer Research UK. The total figure raised was £7,197.41 through ticket sales, donations, sponsorship payments and events held on the day including raffles, cake & gift sales and tombola. Cancer Research UK has been working on pioneering life-saving research for over a century. No other charity anywhere in the world is doing more to beat cancer than Cancer Research UK, fighting over 200 cancers! Here in the UK they are the single largest funder of cancer research. They have saved millions of lives by discovering new ways to prevent, diagnose and treat cancer, and survival has doubled over the past 40 years. Every day in the UK there are more than 400 people diagnosed with cancer that will survive the disease for more than 10 years thanks to research. Cancer Research UK fund research into more than 200 types of cancer, from the most common – such as breast, bowel, lung and prostate cancers – to rare types of tumour and children’s cancers, they support groundbreaking science that benefits everyone. A huge thank you from Kris to all of the participants and to Redhill Academy for hosting the event free of charge and to the following individuals for their support, hardwork and donations…Anne Greener, Debbie Fewkes, Denise Barker, Elaine Chadbourne, Emma Picker, Faye Henrys, Jenna Bradshaw, Kelly Banning, Kelly Chapman, Kirsty Pearson, Mandy Cusick, Nev Bradshaw, Penny Prince, Rebecca Hazeldine, Tracey Watson and Vernon Coaker MP. Experian made an incredibly generous donation of £1,500 in support of their employee Paul Sharman who participated in the Zumbathon. The donation was made directly to Cancer Research but is included in the final figure raised for the Zumbathon. New York Nails, 34 Upper Parliament St, Nottingham NG1 2AG, 0115 941 0781. 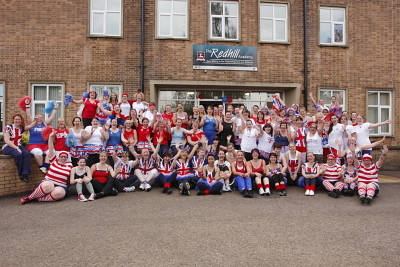 On Saturday the 27th of April 2013 Zumba4Fitness held a fund raising Zumbathon for registered charity Help 4 Heroes raising a total of £4,431.72! Over 90 participants danced for an hour and half to raise much needed cash for Help 4 Heroes. All ticket sale proceeds were donated to H4H, further funds were raised on the day with raffle tickets, a tombola, gift stall, cake stall and the sales of beverages and many participant raising further funds through sponsorship. All funds were donated to Help 4 Heroes via our online donation page. Help for Heroes (H4H) was founded in 2007 and supports veterans and serving personnel who have been wounded or injured, or have become sick, as a result of serving their country. Additionally their families and dependents receive support from the Charity as they care for their loved one, and adapt to the new challenges that they face. The charity’s primary focus is on those affected by recent and current conflicts due to the urgency and extent of their needs. H4H is a tri-service military charity, providing support to full time, reservist Servicemen and women and veterans from the Royal Navy, Army and Royal Air Force. As well as providing support for veterans, serving personnel and their families H4H run four Recovery Centre’s across the UK offering support to 100’s of individuals per week, providing a launchpad-to-life where the wounded and their families can access psychological, financial and employment support, all in one place. They also make grants to other specialist charities to support their vital specialist work e.g. Haig Housing Trust, SkillForce, Horseback UK, Winston’s Wish and Canine Partners. Kris and Jonathan would like to send a heartfelt thank you to every participant, not only for participating but for all of the support they gave helping to organise and publicise the event, for the sponsorships and donations they secured and for, yet again, making our annual fund raising event so incredibly special. 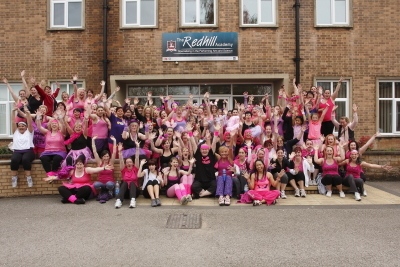 On 28th April 2012 Zumba4Fitness held a fund raising Zumbathon for registered charity Clic Sargent, the UK’s leading charity for children and young people with Cancer raising a total of £6,295.74! Over 100 dancers participated in non stop dancing for one and a half hours to raise much needed cash for Clic Sargent based in the East Midlands at Queens Hospital and City Hospital and in other locations throughout the UK. Funds were raised through ticket sales, sponsorships, donations and events held on the day. CLIC Sargent is the UK’s leading cancer charity for children and young people, and their families. They provide clinical, practical, financial and emotional support to help children and their families cope with cancer and get the most out of life. They are there from diagnosis onwards and aim to help the whole family deal with the impact of cancer and its treatment, life after treatment and, in some cases, bereavement. Kris and Jonathan would like to say a huge thank you to each and every participant, not only for participating but for all of the support they gave helping to organise and publicise the event, for the sponsorships and donations they secured and for making the day incredibly special. Kris and Jonathan also wish to thank Redhill Academy School who hosted the event free of charge and thank the following companys and individuals for their kind prize donations and support.